When it comes to Salmon Fishing Tackle the local tackle shop usually will be able to advise you on the right rod for the area, and don’t forget most tackle shops have good return policies. The rod is the most important piece of Salmon Fishing Tackle that you have to get. When picking the rod get one that is comfortable for you, if the rod is not comfortable – especially a fly rod, you will not stick at it. When you are picking a rod for coarse fishing you have a bit of leeway but when choosing your Salmon Fishing Tackle you have to get it right. Due to the strength of the Salmon the reel needs to be all of the above because anything less and you will be loosing fish left, right and center. The gearing need to be precision manufactured to allow you to play the fish and strong enough to take the shock of a sudden turn from the fish. The drag has to be set right and not weak enough that it can’t hold while you are playing the fish. 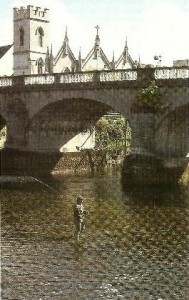 The line selection is determined by the method of fishing. If you are fly fishing you will need a leader made from line with a breaking strain of at least 3Kg ( 6 to 7 Lbs). Remember the Salmon is going to be bigger and stronger than most of the other fish you would be fly fishing for, except for maybe Pike. Also ensure you have backing on the line to allow for long runs. If you are lure or bait fishing you want line in around 6 – 8 Kg ( 12 to 16 Lbs ). Something you may want to take into account when using these methods are the teeth that the Salmon has, these maybe able to cut through your line so you may want to use a wire trace on the line.